Cell-to-cell transfer of protein aggregates, or proteopathic seeds, may underlie the progression of pathology in neurodegenerative diseases. Here, a novel FRET flow cytometry assay is described that enables specific and sensitive detection of seeding activity from recombinant or biological samples. Furman, J. L., Holmes, B. B., Diamond, M. I. Sensitive Detection of Proteopathic Seeding Activity with FRET Flow Cytometry. J. Vis. Exp. (106), e53205, doi:10.3791/53205 (2015). Increasing evidence supports transcellular propagation of toxic protein aggregates, or proteopathic seeds, as a mechanism for the initiation and progression of pathology in several neurodegenerative diseases, including Alzheimer's disease and the related tauopathies. The potentially critical role of tau seeds in disease progression strongly supports the need for a sensitive assay that readily detects seeding activity in biological samples. By combining the specificity of fluorescence resonance energy transfer (FRET), the sensitivity of flow cytometry, and the stability of a monoclonal cell line, an ultra-sensitive seeding assay has been engineered and is compatible with seed detection from recombinant or biological samples, including human and mouse brain homogenates. The assay employs monoclonal HEK 293T cells that stably express the aggregation-prone repeat domain (RD) of tau harboring the disease-associated P301S mutation fused to either CFP or YFP, which produce a FRET signal upon protein aggregation. 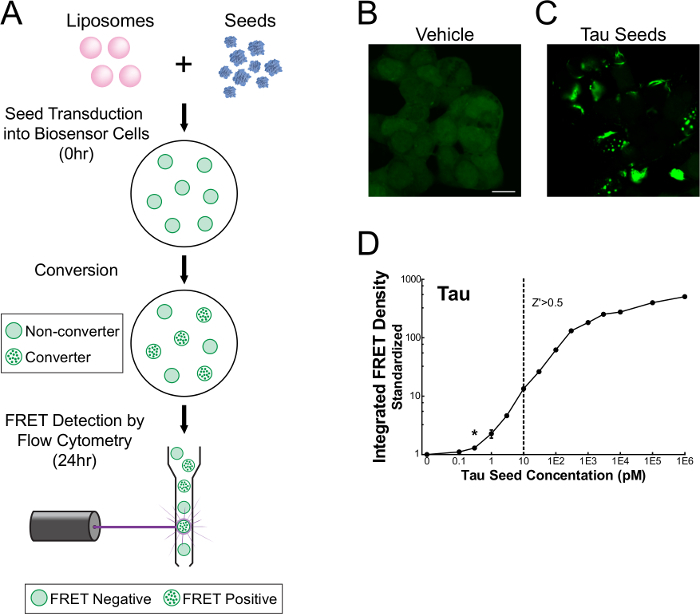 The uptake of proteopathic tau seeds (but not other proteins) into the biosensor cells stimulates aggregation of RD-CFP and RD-YFP, and flow cytometry sensitively and quantitatively monitors this aggregation-induced FRET. The assay detects femtomolar concentrations (monomer equivalent) of recombinant tau seeds, has a dynamic range spanning three orders of magnitude, and is compatible with brain homogenates from tauopathy transgenic mice and human tauopathy subjects. With slight modifications, the assay can also detect seeding activity of other proteopathic seeds, such as α-synuclein, and is also compatible with primary neuronal cultures. The ease, sensitivity, and broad applicability of FRET flow cytometry makes it useful to study a wide range of protein aggregation disorders. The accumulation of intracellular tau amyloids defines tauopathies such as Alzheimer's disease. In early disease stages, pathology is generally localized to discrete regions of the brain, but with disease progression, pathology invariably spreads along distinct neural networks1-5. Accumulating evidence suggests transcellular propagation of toxic protein aggregates underlies this pathology (reviewed in 6-10). In this model, proteopathic seeds (e.g., tau) are released from donor cells and enter neighboring cells, transforming native tau protein into the misfolded form via templated conformational change11-15. The assay described here was developed to sensitively detect such seeding activity. It is compatible with recombinant protein and biological samples and enables quantification of minute levels of proteopathic seeding activity16. HEK 293T cells that stably express tau repeat domain (RD) containing the disease-associated P301S mutation fused to either CFP or YFP (hereafter referred to as tau-RD-CFP/YFP cells) serve as a stable biosensor of seeding activity. In the absence of proteopathic seeds, the cells maintain tau as a soluble monomer, and have no appreciable background FRET. Spontaneous uptake or liposome-mediated transduction of tau seeds into cells, however, results in RD-CFP and RD-YFP aggregation, which produces a FRET signal that is measured within single cells via flow cytometry. Numerous components of this assay were engineered to enhance sensitivity and reduce variability. A monoclonal cell line with a 1:1 RD-CFP/YFP expression ratio was selected, as it provides optimal signal:noise. To increase sensitivity, phospholipids are used to introduce seeds directly into cells (although to study biological mechanisms of uptake, this can be omitted). Finally, flow cytometry monitors FRET at a population level and a single cell level, unlike other protein aggregation assays. The final outcome measure, integrated FRET density, is highly quantitative and accounts both for the number of cells with aggregation, and the degree to which aggregation has occurred within each cell. All of these optimized parameters enhance sensitivity and ensure reproducibility. This system was recently employed in a comprehensive study in transgenic P301S tauopathy mice17 that evaluated the temporal onset and progression of tau seeding activity relative to other commonly used tau pathological markers (e.g., MC1, AT8, PG5, and ThioflavinS). Seeding activity is by far the earliest and most robust marker of tau pathology evaluated, preceding histological detection by at least 6 weeks. Seeding activity appears at 1.5 months and increases progressively with age, suggesting a causal role of proteopathic seeds in the onset and/or progression of neurodegeneration16. Precise quantitation of minute levels of seed material from biological samples can facilitate studies that monitor early disease progression. By shortening trial duration and enabling use of younger animals, this could increase the efficiency and accuracy of preclinical animal trials. For example, in the P301S mouse previously described, lead compounds could be delivered as early as 4-6 weeks (immediately prior to, or at onset of seeding activity), and monitored for efficacy 2-4 weeks later. The assay should accurately quantify any reductions in seeding activity. FRET flow cytometry has in vitro screening applications as well. For example, anti-tau reagents (e.g., antibodies, small molecules, etc.) can be tested rapidly for their capacity to block seeding induction directly in culture, using either recombinant tau aggregates or brain-derived lysates as a seed source (Figure 5). With this setup, once seed material is prepared, an experiment takes just three days to complete, including data analysis. The rapid quantitation of proteopathic seeding activity can thus facilitate many studies of neurodegeneration. NOTE: This protocol emphasizes the use of FRET flow cytometry for detecting seeding activity from mouse biological samples. It is also compatible with recombinant fibrils and human biological samples. Mouse euthanasia and brain harvesting was performed in accordance with IACUC-approved procedures. Place extracted tissue in a cryo-vial, and snap freeze by placing in liquid nitrogen. Alternatively, freeze tissue on dry ice. Once frozen, transfer tissue to -80 °C and store for an extended period of time, if necessary. NOTE: This protocol is compatible with whole brain homogenates or micro-dissected brain regions. See Hagihara et al. for a detailed micro-dissection protocol19. Prepare homogenization buffer by dissolving protease inhibitors (EDTA free) into 1x TBS (1 tablet per 10 ml). Vortex vigorously, and store on ice. Protease inhibitors must be EDTA free in order to preserve biosensor cell viability. Weigh frozen brain tissue in a disposable weigh boat, and transfer to a 5 ml conical tube. Add ice-cold homogenization buffer such that the final solution is 10% weight/volume. Temporarily store on ice. Tissue mass and subsequent homogenization buffer volume will vary depending on the brain size and/or regions used. Here, an adult mouse hemibrain weighing 0.2 g is suspended in 2 ml for a 10% w/vol solution. Transfer samples into a cold room, and adjust a probe sonicator to the appropriate settings. For probe sonication with an Omni Ruptor (shown here), set the power to 20%, which corresponds to approximately 75 W. Use a pulse mode to ensure samples are not over-heated during sonication. Set the pulser to 30%, corresponding to approximately 500 msec. Clean the tip of the probe sonicator by rinsing with water, isopropanol, and water again, wiping off the probe in between each solution. Be certain to rinse and wipe both the sides and bottom of the probe with lab-wipes. Working with one sample at a time, submerge the probe tip into the homogenization buffer, and start the sonicator. Using the power and pulser settings described above, deliver 25 total pulses. Ensure that tissue is completely in suspension. Be careful to avoid foaming of the sample during this step. NOTE: Samples are susceptible to foaming if a) the total volume is low or b) the homogenate warms up. With this specific instrument, do not sonicate with volumes less than 250 µl. To ensure samples stay chilled, tubes may be stored on ice during this step. Clean the probe by wiping away residual lysate, then deliver 10 pulses into a beaker of clean water. Rinse the sides and bottom of the probe with water, isopropanol, and water again (as in step 2.4), wiping dry in between each step. To avoid contamination, thoroughly rinse the probe in between samples. NOTE: With tau aggregates, we have not found that more stringent cleaning methods are necessary for preventing sample-to-sample contamination. Other amyloids, however, may require additional care which has been extensively described in literature20,21. Store homogenates on ice until all samples have been processed. Spin homogenates at 21,300 x g for 15 min at 4 °C. Transfer the supernatant to a clean tube, taking care not to disturb the pellet. Discard the pellet. Aliquot the supernatant, and store lysates at -80 °C for further use. Avoid freeze/thaw cycles of the homogenates, however, as this reduces seeding efficiency. NOTE: Use four cell lines for this assay: HEK 293T (cell line #1), RD-P301S-CFP (cell line #2), RD-P301S-YFP (cell line #3), and RD-P301S-CFP/YFP (cell line #4). Please reference Table 1 for each cell line’s contribution to the assay. In a sterile environment, aspirate culture medium. Rinse cells with warm PBS, and aspirate. Trypsinize cells (3 ml of trypsin-EDTA (0.05%)) for 3 min, quench with warm culture medium (9 ml of DMEM, 10% FBS, 1% pen/strep, 1% GlutaMax), and immediately transfer cells to a conical tube. Centrifuge cells at 1,000 x g for 5 min at RT. Aspirate medium, and resuspend cell pellet in warm culture medium. Using a hemocytometer, determine the cell density for each cell line. Cell density will vary depending on confluency at time of harvesting and resuspension volume. Resuspend cells harvested from a 10 cm dish at 90% confluency in 10 ml media, for cell density to be approximately 1 million cells/ml. Make a master mix of cells + media such that each well of a 96 well plate will contain 35,000 cells in 130 µl media (e.g., to make a master mix for 100 wells, resuspend 3.5 million cells in 13 ml media). Modify the cell number to fit individual experimental designs and timelines. For cell treatment ~18 hr after plating, add 35,000 cells to each well of a 96-well plate. Using a multi-channel pipet, slowly pipette 130 µl of master mix cell suspension into each well of a flat bottom, tissue culture-treated 96 well plate. While plating, place the pipet tip in the center of the well, not touching the bottom of the plate. NOTE: Though plating format can be modified, making n = 4 wells for each of cell lines 1-3 per plate is recommended. The remainder of the plate (n = 84) is reserved for cell line #4 (biosensor cells). Allow the cells to settle by leaving the plate undisturbed for 10 min at RT. Incubate O/N at 37 °C, 5% CO2, and ≥80% relative humidity. In one tube, combine transfection reagent, such as Lipofectamine, with reduced-serum media, such as Opti-MEM, to make a master mix. Per well, add 1.25 µl transfection reagent and 8.75 µl reduced-serum media. Flick tube gently to mix, briefly spin down, and incubate for 5 min at RT. In another tube, combine seed material (aliquot of lysate from step 2.9) with reduced-serum media. NOTE: Volume of seed material will vary according to the individual experiment. When choosing seed volume, take into consideration: abundance of seeds in a sample and potential toxicity. Crude homogenates can be toxic to cells. As such, use the lowest volume possible to monitor your desired effect. Previously tested volumes of lysate/well range from 1-5 µl, corresponding to 5-20 µg total protein. Ensure that the total volume per well (seeds + reduced-serum media) is 10 µl. Combine contents from the two tubes described in 4.1 and 4.2, flick gently to mix, briefly spin down (1,000 x g, 5 sec), and incubate at RT for at least 20 min and up to 2 hr. Gently pipette 20 µl of transduction complex on the side of individual biosensor wells. Use three technical replicates, if possible. Return treated cells to the incubator for 24-48 hr. Incubate under the same conditions as described in step 3.6. NOTE: The appropriate negative control condition for this setup is biosensor cells treated with empty liposomes (i.e., liposome reagent + reduced-serum media) because application of phospholipids introduces a slight shift in the fluorescence profile relative to biosensor cells unexposed to liposome reagent. NOTE: Before harvesting cells—generally 24-48 hr post-treatment—it is possible to get a preliminary readout of seeding activity using the GFP filter on a standard inverted fluorescence microscope. Cells treated without seed material (i.e., empty liposomes) will show diffuse fluorescence, whereas cells treated with seed material will show intense punctate and reticular intracellular inclusions (Figure 1A-B). Using a multi-channel pipet, aspirate all cell medium (150 µl) . Trypsinize (50 µl) cells for 5 min, and quench with 150 µl chilled culture medium. Do not include a PBS rinse prior to trypsinization at this step, as it may cause cell lifting and subsequent cell loss. Exclude any contaminating dead cells and debris during flow cytometry via gating strategies. Immediately after quenching, transfer cells to a 96 well round bottom plate, and centrifuge at 1,000 x g for 5 min at RT. Aspirate and discard medium, taking care to avoid disturbing the cell pellet. Gently, but thoroughly, resuspend the cell pellet in 50 µl 2% paraformaldehyde, and incubate for 10 min. Alternatively, run cells live, although fixation provides cleaner and more consistent results. Centrifuge cells at 1,000 x g for 5 min at RT. Aspirate and discard paraformaldehyde, taking care to avoid disturbing the cell pellet. Gently, but thoroughly, resuspend the cell pellet in 200 µl chilled flow cytometry buffer (HBSS, 1% FBS, 1 mM EDTA) and run the plate as soon as possible to avoid cell clumping. NOTE: Use a flow cytometer such as the MACSQuant VYB, which is equipped with FRET-compatible laser lines and filter sets (Table 2). For each step within this section, click the well of interest using the software’s 96 well template, and click “play” to begin sample uptake and flow. Make plots or statistics tables by clicking the 'new analysis window' icon. Change axis parameters on individual bivariate plots by clicking the title on either the X or Y axis and selecting the appropriate filter. To shift cell populations or fluorescence signals, increase or decrease the voltages associated with the appropriate filters. With this instrument, run <1,000 events/sec to ensure accurate single-cell monitoring. Make a Side Scatter-Area (SSC-A) vs Forward Scatter-Area (FSC-A) bivariate plot, and with cell line #1 running, adjust the SSC and FSC voltages until the cell population is in the lower left quadrant. Click the polygon tool, and define the cell population (Gate P1). For all gating parameters see Figure 2. Make a FSC-H (height) vs FSC-A bivariate plot, and apply Gate P1 to this plot by clicking “live” above the plot, and selecting P1. With cell line #1 running, click the polygon tool, and define single cells (Gate P2). Make 3 histogram plots, one for each of the filters of interest: CFP, YFP, and FRET. Apply Gate P2 to all of these plots by clicking “live” above the plots, and selecting P2. With cell line #1 running, adjust voltages such that the median cell population in the CFP, YFP, and FRET histograms are all between 0 and 1. To measure CFP and FRET, excite cells with the 405 nm laser, and capture fluorescence with a 450/50 nm and 525/50 nm filter, respectively. To measure YFP, excite cells with a 488 nm laser and capture fluorescence with a 525/50 nm filter. Laser and filter settings are further described in Table 2. Perform compensation for CFP spillover into the FRET and YFP channels. NOTE: Compensation is the process of fluorescence spillover correction. Fluorescence spillover occurs whenever the fluorescence emission of one fluorochrome is detected within a filter designed to measure signal from another fluorochrome. With proper compensation, the CFP spillover fluorescence can be removed from the FRET and YFP channels. NOTE: Compensation requires the presence of both fluorescence -positive and -negative cells. Thus, to compensate on CFP-positive cells (cell line #2), negative cells (cell line #1) must be added to the sample prior to the run. Spike in 30 µl of cell line #1 suspension from a single well into 200 µl of cell line #2 suspension immediately prior to compensating. Click the “Instrument Settings” icon, then 'compensation' tab, and check 'matrix' to open the compensation table. Make a FRET-A vs CFP-A bivariate plot, and apply gate P2, as described in step 6.3. With cell lines 1+2 running, click the 'quadrant' icon and draw quadrants such that the fluorescence -negative and -positive populations are separated by the lower two quadrants (Gates LL3 and LR3, respectively). Create a statistics table that displays the median fluorescence intensity (MFI) of FRET for the LL3 and LR3 gates. Adjust the FRET parameter in the compensation matrix until the MFI of the FRET signal is equivalent between LL3 and LR3. Following this step, the MFI of the FRET signal is equal between unstained cells and CFP-positive cells, suggesting the absence of CFP spillover into the FRET channel. Make a YFP-A vs CFP-A bivariate plot, and apply gate P2, as described in step 6.3. Draw quadrants (LL4 and LR4) similar to that done in step 6.4.3. Create a statistics table that displays the MFI of YFP for LL4 and LR4. Adjust the YFP parameter in the compensation matrix until the MFI of the YFP signal is equivalent between LL4 and LR4. Following this step, the MFI of a YFP signal is equal between unstained cells and CFP-positive cells, suggesting the absence of CFP spillover into the YFP channel. Following gate setup and compensation, highlight wells of interest and run the remainder of the plate. After all samples have been run, export data files by clicking 'file', then 'copy'. Select the 'data files' tab, highlight the experiment folder, and click 'copy'. NOTE: Change axis parameters on individual bivariate plots by clicking the title on either the X or Y axis and selecting the appropriate filter. Open FCS files in the flow cytometry analysis program. Based on scatter properties, use a polygonal gate to define the cell population (SSC vs FSC) and singlet population (FSC-H vs FSC-A) from cells treated with empty liposomes, similarly to that described in Section 6. If CFP compensation was performed during setup, do not further adjust CFP. Define a FRET gate by plotting empty liposome-treated CFP/YFP cells on a FRET vs CFP bivariate plot. Introduce a polygonal gate along the slope of the population that extends upward and leftward away from the population. This gate should exclude most cells (~99%), such that background FRET is ≥1% of cells. Any events that shift into this gate are considered FRET-positive. NOTE: Each individual gate described above is applied to all samples before constructing subsequent gates. Following analysis, four individual gates are defined (Cell population; singlet; false FRET; FRET). Record analysis parameters of interest, including: percent FRET positivity and MFI of FRET-positive cells. Manually calculate the integrated FRET density by measuring the product of percent positivity and MFI. NOTE: If integrated FRET density is used as an outcome measure, set background FRET (as defined in step 7.5) and MFI to greater than or equal to 1 in order to avoid calculating a product that is less than its two individual factors. FRET flow cytometry enables sensitive, quantitative, and rapid detection of seeding activity from recombinant or biological samples. Assay setup is facile: monoclonal-derived stable cell lines expressing tau-RD-CFP/YFP are transduced with seed material, incubated for 24-48 hr, and subjected to flow cytometry analysis (Figure 1A). In the absence of seeds, biosensor cells maintain tau in a soluble, monomeric form (Figure 1B). In the presence of seeds, however, biosensor cells convert tau into an aggregated state (Figure 1C), producing a FRET response that is detected on a per-cell basis with flow cytometry. Quantitative assessment shows that biosensor cells respond to femtomolar concentrations of seed material and that seeding activity can be effectively measured across three orders of magnitude (Figure 1D). Gating parameters were established to ensure detection of a true FRET signal, even at low seed concentrations. First, standard gating methods are used to isolate the cell population (Figure 2A) and single cells (Figure 2B). False FRET signal can arise from direct activation of YFP by the 405 nm laser. Thus, a False FRET gate is drawn from a YFP single-positive cell population to exclude contaminating signal (Figure 2C). Last, the FRET gate is defined from unseeded CFP/YFP dual-positive cells (Figure 2D). A gate is drawn near the slope of the population that extends upward and leftward away from it. Unstimulated cells should have a background FRET value set to approximately 1%, and FRET-positive cells will shift into this gate in a dose-dependent manner (compare Figure 2E and 2F). Multiple parameters are taken into account with FRET flow cytometry, including: percent positivity (i.e., the number of FRET-positive cells per total cell count) and median fluorescence intensity (i.e., the degree to which a FRET response is produced in a FRET-positive cell). Integrated FRET density is the preferred outcome measure, as it is the product of these two variables and wholly represents the degree of seeding activity induced by any given sample. FRET flow cytometry is compatible with P301S tauopathy mouse-derived brain lysates, even at young ages, as displayed in Figure 3. Following microdissection of four different brain regions, FRET flow cytometry was used to measure seeding activity from brainstem (Figure 3A), neocortex (Figure 3B), frontal lobe (Figure 3C), and hippocampus (Figure 3D) in P301S mice over a range of ages. In each region, seeding activity increased with age and appeared at just 1.5 months. However, tau knockout mice (“KO”) >12 mos never displayed seeding activity. Compared to histological analyses performed within the same animals, this is six weeks sooner than the appearance of any other marker of tau deposition (Figure 3E), including markers of conformationally-aberrant tau (MC1), hyperphosphorylated tau (AT8 and PG5), and amyloid conformation (ThioflavinS). From a mechanistic view, the proximal detection of tau seeding activity suggests seeds as a causal mediator of tauopathy onset and/or progression. From an experimental view, this suggests that analysis of seeding activity may be an ideal supplement to standard outcome measures of tau deposition, given its early and robust appearance. In addition to transgenic mice, FRET flow cytometry is compatible with human brain lysates and can readily detect tau aggregates isolated from Alzheimer's disease subjects (Figure 4). When frozen human brain tissue is homogenized in the same manner as described here for P301S brain lysates, seeding activity is robustly detected from all samples derived from AD subjects. In contrast, seeding activity is never detected from lysates of age-matched or Huntington's disease control subjects. This emphasizes the specificity of the assay for tau aggregates. While the focus of this article is sensitive detection of tau seeding activity using liposome-mediated delivery of aggregates into HEK 293T biosensor cells, more physiological cell culture paradigms can also be performed with FRET flow cytometry to assess basic cellular uptake mechanisms. For example, primary neuronal cultures can be infected with lentivirus expressing the tau-RD-CFP and tau-RD-YFP constructs at time of plating. At DIV4, aggregation is absent in untreated cells (Figure 5A) but detectable in neurons treated with seed-containing material (Figure 5B). Importantly, phospholipids are excluded in these experiments, permitting the investigation of physiological and pathophysiological seeding mechanisms. Thus, application of tau fibrils leads to neuronal HSPG-mediated uptake and stimulates aggregation in a dose-dependent manner that can be quantified with FRET flow cytometry (Figure 5C). Additionally, the assay can be employed for therapeutic evaluation of tau uptake and seeding blockade in vitro using HEK 293T tau biosensor cells. Even in the absence of phospholipids, both recombinant fibrils (Figure 5D) and P301S brain lysates (Figure 5E) induce tau aggregation. 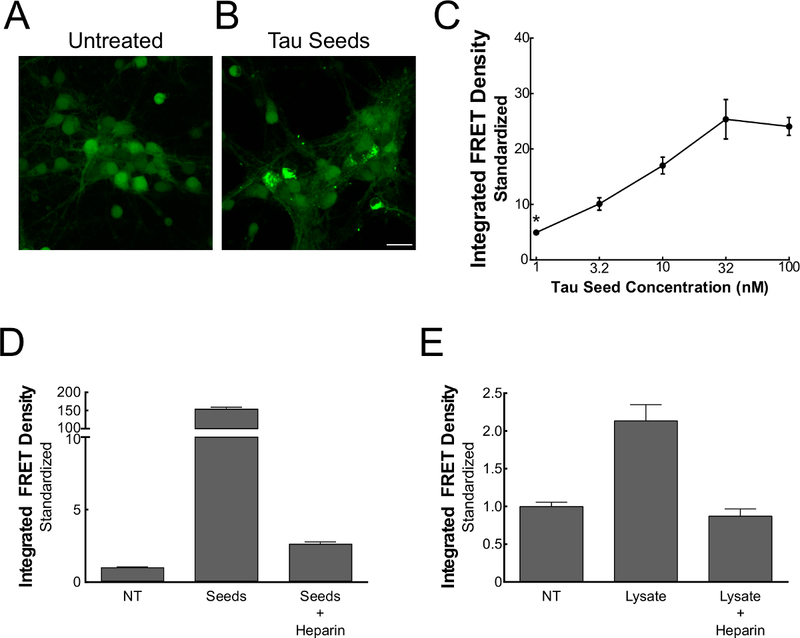 Pre-incubation of these tau seeds with heparin (previously shown to be a potent inhibitor of HSPG-mediated tau uptake), however, eliminates their seeding capacity. This experimental setup could be applied to any drug (e.g., antibodies, small molecules, etc.) and would enable rapid evaluation of uptake and/or seed-modifying therapeutics. Figure 1. FRET flow cytometry sensitively detects tau seeding activity16. Monoclonal HEK 293T cells expressing tau-RD-CFP/YFP were transduced with recombinant or biological samples, incubated for 24-48 hr, and analyzed on a single cell basis using flow cytometry (A). Unstimulated cells maintain tau-RD in a monomeric state (B), whereas cells treated with seed-containing material display prominent inclusions (C). Quantitative assessment (mean ± S.E.M.) of seeding activity shows that FRET flow cytometry is sensitive to femtomolar concentrations (monomer equivalent) of recombinant seed material and detection spans three orders of magnitude (D). Monomer equivalent represents the total amount of protein contained within the fibrillization reaction and does not correct for the incomplete incorporation of monomer into aggregated material. Thus, the concentration of actual aggregates (seeds) must be less than or equal to its 'monomer equivalent'. *Modified from Holmes and Furman et al.16 Please click here to view a larger version of this figure. Figure 2. Gating strategy for FRET flow cytometry. Cell population (A) and singlet/doublet (B) gates are drawn with standard flow cytometry methodology. A false FRET gate (C) is drawn from YFP single-positive cells to eliminate YFP bleedthrough into the FRET filter. A FRET gate (D) is constructed from empty liposome-treated cells, such that background FRET is ≥1%. A population shift into the FRET gate appears following treatment with seed-positive material (E) and the shift becomes increasingly prominent with higher amounts of seed material (F). Final readouts include: percent FRET positivity, median fluorescence intensity (MFI) of FRET-positive events, and the integrated FRET density (Integrated FRET Density = Percent positive cells * MFI). Please click here to view a larger version of this figure. Figure 3. Progression of tau seeding activity in P301S mice16. Seeding activity (mean ± S.E.M.) from brain homogenates of P301S mice is apparent at 1.5 months in brainstem (A), neocortex (B), frontal lobe (C), and hippocampus (D). However, seeding activity is never observed in tau knockout mice (>12 months). Seeding activity increases with age and precedes the appearance of other common histological markers, including MC1, AT8, and PG5 (E). *Reprinted with permission from Holmes and Furman et al.16 Please click here to view a larger version of this figure. Figure 4. Compatibility of FRET flow cytometry with human biological samples16. When tau-RD-CFP/YFP biosensor cells are transduced with 20 µg human brain lysate, robust seeding (mean ± S.E.M.) occurs in all tested Alzheimer's disease brains, whereas age-matched and Huntington's disease control lysates lack seeding activity. *Modified from Holmes and Furman et al.16 Please click here to view a larger version of this figure. Figure 5. Alternative applications for FRET flow cytometry16. Primary neurons transduced with lentivirus encoding tau-CFP and tau-YFP constructs. In the absence of exogenous seeds there is no apparent aggregation (A), but there is in the presence of seeds (B). Neuronal biosensors respond dose-dependently to recombinant tau seeds, even in the absence of phospholipid-mediated delivery (C). Pre-incubation of recombinant (D) or biological (E) seed sources with heparin, an inhibitor of HSPG-mediated tau seed uptake, depletes FRET responsiveness of HEK 293T biosensor cells. Quantitative assessment displays (mean ± S.E.M.). *Modified from Holmes and Furman et al.16 Please click here to view a larger version of this figure. Table 1: Cell lines used with FRET flow cytometry. HEK 293T cells are used for flow cytometry setup. CFP single-positive cells are used for compensation (*). YFP single-positive cells are used to eliminate false FRET signal due to direct activation of YFP by 405 nm excitation. CFP/YFP dual-positive cells are FRET-compatible and serve as the biosensor cells. Please click here to view a larger version of this table. Table 2: Flow cytometer laser and filter settings. Please click here to view a larger version of this table. The FRET flow cytometry system described here is a powerful tool for quickly and quantitatively assessing tau seeding activity. It requires only moderate cell culture experience and a working knowledge of FRET and flow cytometry. Other seeding assays, such as Thioflavin T - which exhibits enhanced fluorescence when bound to beta sheet structure - are laborious and require a pure, recombinant protein substrate. Additionally, in vitro seeding assays for tau are only semi-quantitative and generally insensitive to subnanomolar levels of seed material23,24. FRET flow cytometry, however, provides a quantitative and exquisitely sensitive measure of seeding activity from either recombinant or biological samples. Furthermore, adaptations to the procedure can make it useful to study a variety of protein aggregation disorders. While the protocol described herein focuses on tau seeding, only simple modifications are required to enable a user to monitor seeding activity from alternate types of proteopathic seeds. As demonstrated in Holmes and Furman et al., creation of a monoclonal cell line stably expressing α-synuclein harboring the disease-associated A53T mutation tagged to either CFP or YFP enabled sensitive detection of seeding activity from full-length α-synuclein recombinant fibrils16. Similar experiments have been performed using Huntingtin biosensor cells, which also effectively detect protein aggregation. Thus, by merely modifying the protein biosensor, FRET flow cytometry is compatible with numerous seed sources. Other modifications to the assay, including treatment paradigm and cell model, may be used to make FRET flow cytometry more applicable to assessing physiological mechanisms. In this protocol, seeds were directly introduced into biosensor cells via liposome-mediated transduction as a way to increase sensitivity. It is important to note, however, that this is not a requirement. Tau aggregates from recombinant or mouse biological samples are still capable of seeding biosensor cells in the absence of liposomes (Figure 5). Thus, labs interested in studying physiological propagation and/or uptake mechanisms of tau seeds may still employ the assay. Additionally, FRET flow cytometry is compatible with primary neuronal cultures. By infecting cells with CFP- and YFP-encoded lentiviral constructs at time of plating, efficient FRET responsiveness is attained at nanomolar concentrations following treatment with recombinant tau fibrils, even in the absence of liposomes (Figure 5). 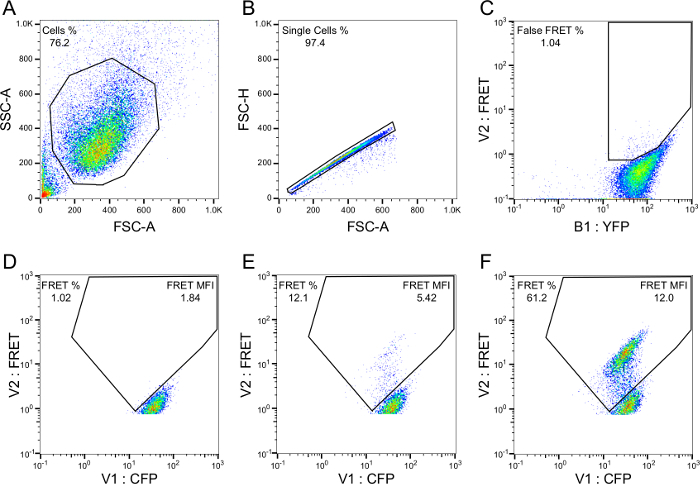 Taken together, these data indicate that FRET flow cytometry is useful for studying physiological mechanisms of seeding for a variety of protein aggregates and in multiple cell culture models. While the FRET flow cytometry system is user-friendly and adaptable, certain key steps should be followed to ensure compatibility, including sample preparation and proper cell confluency at time of treatment. High intensity probe sonication of brain specimens is critical for effective and optimal isolation of seeding activity. During development and optimization, it was observed that that this method is over 10 times more effective at isolating seeding activity from P301S mouse brains relative to other common techniques, e.g. handheld homogenization. It is possible that very large tau aggregates have a relatively low seeding propensity, and that probe sonication is most effective for breaking these aggregates into smaller, seed-compatible fragments. Duration and frequency of the sonication may be modified if necessary, although the settings described above are recommended for sensitive detection of seeding activity. Cell confluency at the time of treatment is also of utmost importance, as it affects both sensitivity and cell health. If cells are too confluent, they do not readily take up phospholipids and seed material, thereby dramatically decreasing sensitivity. If confluency is too low, addition of phospholipids and seed material can be toxic. Empirical testing shows that a biosensor confluency of 60-65% is optimal for treatment and subsequent responsiveness. As noted in the protocol, compensation algorithms are regularly used to exclude CFP spillover into the YFP and FRET channels, thereby eliminating false signals and increasing sensitivity. For a quicker and qualitative assessment of seeding activity, however, this step may be omitted or performed post hoc using flow cytometry analysis software. A cleaner and more robust signal is obtained following compensation, however, and thus for the most rigorous and quantitative analysis this step is highly recommended. A limitation of the assay is its inability to report on the biochemical composition of the proteopathic seeds. The current assay measures seeding activity, a functional property of seeds. Determination of the biochemical and biophysical nature of the seeds will require coupling to traditional assays such as immunoprecipitation, chromatography, circular dichroism, mass spectrometry, etc. Nonetheless, this assay will prove useful in evaluating seeding potency as an endpoint from myriad specimens. This assay was recently used to quantify and characterize the timecourse of seeding development and progression in P301S mice relative to other common markers of tau deposition, such as histological stains. In this study, tau seeding activity was apparent over six weeks prior to the earliest histological marker (MC1) that we tested16. Given its early appearance, seeding activity may represent an important supplemental, or even alternative, outcome measure for evaluating efficacy of therapeutic interventions, at least for preliminary studies. By shortening treatment course and studying younger animals, housing costs and experimental turnaround time will decrease. It is conceivable that therapeutics could be administered to P301S mice at 4-6 weeks and brains evaluated for seeding activity 2-4 weeks later. Alternatively, evaluation of anti-tau therapeutics in cells could be performed within days by assessing their ability to block induction of seeding activity in biosensor cells, as demonstrated in Figure 5. In conclusion, the FRET flow cytometry seeding assay is an easy and efficient way to detect tau seeding from recombinant or biological sources. Its sensitivity is unparalleled by other in vitro tau seeding assays, and it can be employed to detect the earliest pathological change in P301S tauopathy mice. Furthermore, its flexibility in monitoring numerous proteopathic seeds under different treatment conditions, and with multiple cell culture models, makes it useful for any protein aggregation laboratory interested in quickly gathering quantitative data. This assay has been licensed to Janssen Pharmaceuticals. This work was supported by the Tau Consortium (M.I.D); National Institutes of Health Grant 1R01NS071835 (M.I.D. ), a Department of Defense Grant PT110816 (to M.I.D. ), 1F32NS087805 (to J.L.F. ), and 1F31NS079039 (to B.B.H.). Seeley, W. W., Crawford, R. K., Zhou, J., Miller, B. L., Greicius, M. D. Neurodegenerative diseases target large-scale human brain networks. Neuron. 62, (1), 42-52 (2009). 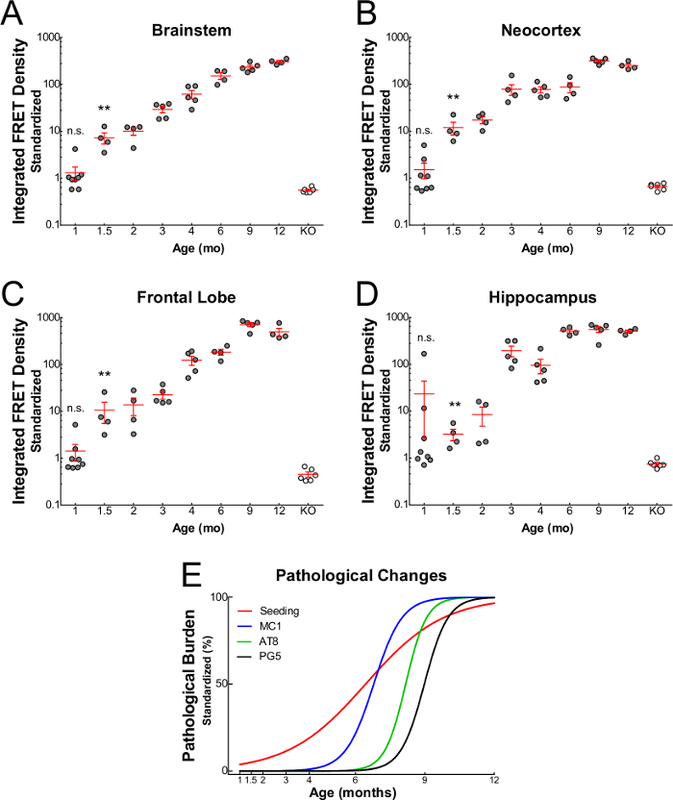 Zhou, J., Gennatas, E. D., Efstathios, D., Kramer, J. H., Miller, B. L., Seeley, W. W. Predicting Regional Neurodegeneration from the Healthy Brain Functional Connectome. Neuron. 73, (6), 1216-1227 (2012). Raj, A., Kuceyeski, A., Weiner, M. A Network Diffusion Model of Disease Progression in Dementia. Neuron. 73, (6), 1204-1215 (2012). Braak, H., Braak, E. Neuropathological stageing of Alzheimer-related changes. Acta Neuropathol. 82, (4), 239-259 (1991). 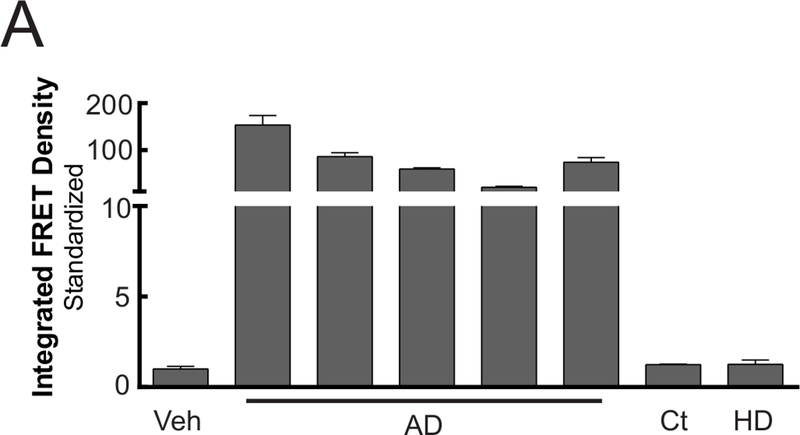 Braak, H., Braak, E. Staging of Alzheimer's disease-related neurofibrillary changes. Neurobiol Aging. 16, (3), 271-278 (1995). Frost, B., Diamond, M. I. Prion-like mechanisms in neurodegenerative diseases. Nat Rev Neurosci. 11, (3), 155-159 (2009). Holmes, B. B., Diamond, M. I. Cellular mechanisms of protein aggregate propagation. Current Opinion in Neurology. 25, (6), 721-726 (2012). Kaufman, S. K., Diamond, M. I. Prion-like propagation of protein aggregation and related therapeutic strategies. Neurotherapeutics. 10, (3), 371-382 (2013). Holmes, B. B., Diamond, M. I. Prion-like properties of Tau protein: the importance of extracellular Tau as a therapeutic target. J Biol Chem. 289, (29), 19855-19861 (2014). Guo, J. L., Lee, V. M. Cell-to-cell transmission of pathogenic proteins in neurodegenerative diseases. Nat Med. 20, (2), 130-138 (2014). Frost, B., Jacks, R. L., Diamond, M. I. Propagation of tau misfolding from the outside to the inside of a cell. J Biol Chem. 284, (19), 12845-12852 (2009). Guo, J. L., Lee, V. M. Y. Seeding of normal tau by pathological tau conformers drives pathogenesis of Alzheimer-like tangles. Journal of Biological Chemistry. (2011). Holmes, B. B., et al. Heparan sulfate proteoglycans mediate internalization and propagation of specific proteopathic seeds. Proc Natl Acad Sci U S A. 110, (33), E3138-E3147 (2013). de Calignon, A., et al. Propagation of Tau Pathology in a Model of Early Alzheimer's Disease. Neuron. 73, (4), 685-697 (2012). Liu, L., et al. Trans-Synaptic Spread of Tau Pathology In Vivo. PLoS One. 7, (2), e31302 (2012). Holmes, B. B., et al. Proteopathic tau seeding predicts tauopathy in vivo. Proc Natl Acad Sci U S A. 111, (41), E4376-E4385 Forthcoming. Yoshiyama, Y., et al. Synapse loss and microglial activation precede tangles in a P301S tauopathy mouse model. Neuron. 53, (3), 337-351 (2007). Gage, G. J., Kipke, D. R., Shain, W. Whole animal perfusion fixation for rodents. J Vis Exp. 65, (65), (2012). Hagihara, H., Toyama, K., Yamasaki, N., Miyakawa, T. Dissection of hippocampal dentate gyrus from adult mouse. J Vis Exp. (33), (2009). Yan, Z. X., Stitz, L., Heeg, P., Pfaff, E., Roth, K. Infectivity of prion protein bound to stainless steel wires: a model for testing decontamination procedures for transmissible spongiform encephalopathies. Infect Control Hosp Epidemiol. 25, (4), 280-283 (2004). McDonnell, G., et al. Cleaning, disinfection and sterilization of surface prion contamination. J Hosp Infect. 85, (4), 268-273 (2013). Banning, C., et al. A flow cytometry-based FRET assay to identify and analyse protein-protein interactions in living cells. PLoS One. 5, (2), e9344 (2010). Morozova, O. A., March, Z. M., Robinson, A. S., Colby, D. W. Conformational Features of Tau Fibrils from Alzheimer's Disease Brain Are Faithfully Propagated by Unmodified Recombinant Protein. Biochemistry. (2013). Sui, D., Liu, M., Kuo, M. H. In vitro aggregation assays using hyperphosphorylated tau protein. J Vis Exp. (95), e51537 (2015).